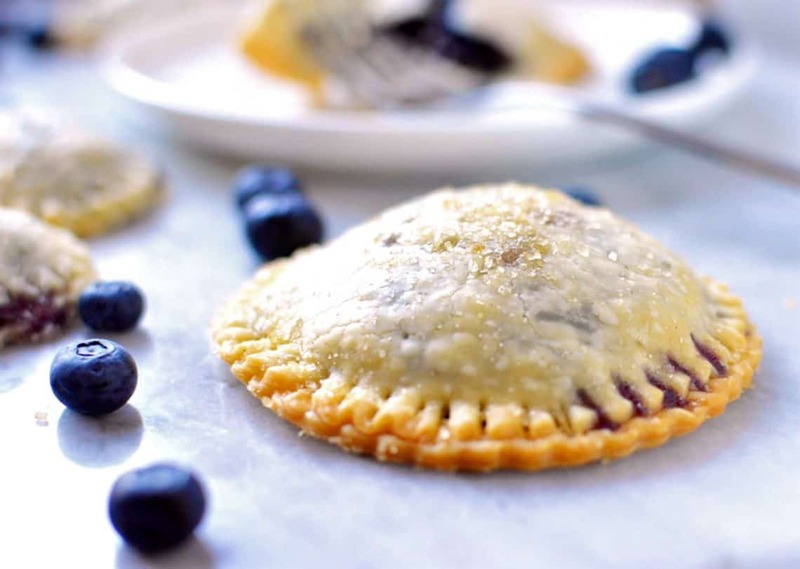 Delicious blueberry mini pie dessert recipe that everyone in the family will love! We made a bunch of these, waited until they were completely cooled and then stored them in a glass food storage container in the chest freezer and they were perfect when we took them out a couple weeks later. Allow the blueberries to thaw and drain in a strainer for a little bit, the longer the better, about an hour is ideal, but perfectly fine if you have less time, they might just be a little juicier. 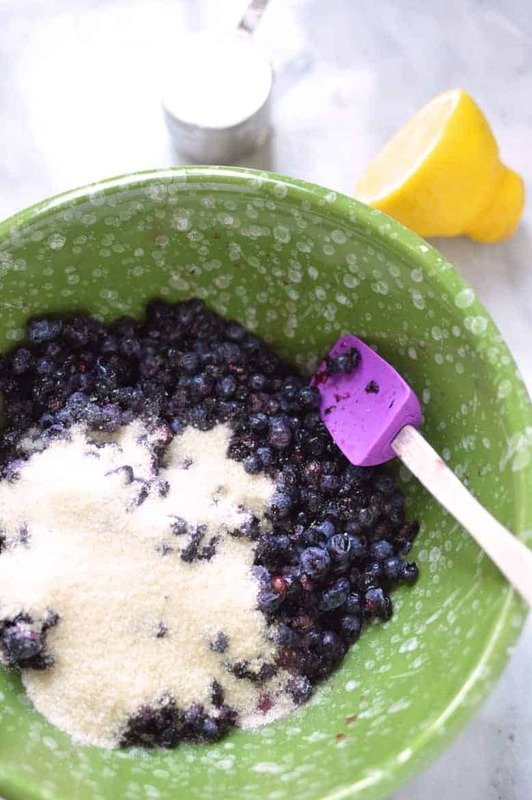 Transfer the berries to a bowl and mix in the lemon, sugar and flour. I let this rest for a little longer to make sure it had enough flour. Roll out your premade pie crust and then use circle cutters to form the tops and bottoms of your mini pies. 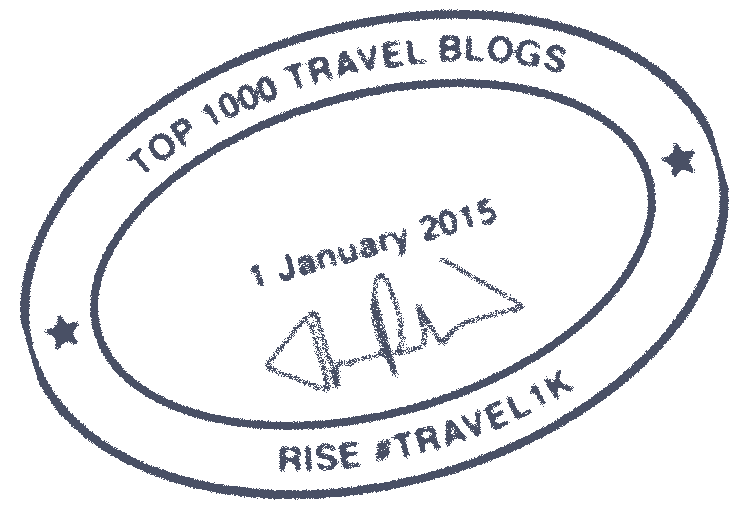 I used three different sizes for fun, but one size will work just as nicely. Add a spoonful of the blueberry filling to the center of half of the circles, avoiding the edges. Top with the matching circles and then use a fork to press the two layers together and poke a few air vent holes in the top. Optional, sprinkle on a little raw sugar to the tops after they mini pies have been in the oven for about 2 minutes, (this allows you to skip messy egg washes). Bake on parchment paper at 375 degrees for about 12 to 16 minutes. The final baking time will really depend on the size mini pies you decide to make and how hot your oven runs. So keep a close eye on that first tray so you’ll know how to best time the following trays. Allow to cool on a wire rack.